Students at South Gallia converse and eat before class. MERCERVILLE — Gallia County Local Schools hosted an event Wednesday morning at South Gallia to showcase its “Grab-N-Go” kiosk and more as the district takes part in the Partners for Breakfast in the Classroom program to provide students with a morning meal. According to a release, students will receive a meal throughout the school year, thanks to a grant awarded by the program and funded by Walmart in the amount of $57,442.91. South Gallia Middle and High School as well as River Valley Middle and High School were selected for the program based on the number of students that qualify for free or reduced priced meals, average daily participation in the school breakfast program and school-level support. More than 1202 of students will reportedly benefit from the program throughout the district. Students at the four schools can now take part in the free breakfast program, to receive, what supporters say, are the nutritional and educational benefits of the morning meal. In January 2018, the grant funding was introduced to Gallia County Local School District by Sonja Hill-Powell, SSN Senior Manager for Ohio Children’s Hunger Alliance. Hill-Powell and Lora Delaney, Gallia County Local Food Service Director, worked together on the grant application and submitted it to Breakfast for Partners in the Classroom. Gallia County Local Schools were selected to participate in the fourth phase of the program, which is a joint initiative from the Food Research and Action Center, National Association of Elementary School Principals Foundation, the School Nutrition Foundation and the Foundation Ohio Children’s Hunger Alliance. School district stakeholders working in conjunction with the program include Treasurer Julia Slone, Grants Clerk Heather Sweeney, Food Service Director Lora Delaney, Superintendent Jude Meyers, Sonja Hill-Powell, South Gallia Principal Bray Shamblin, River Valley High Principal T.R. Edwards and River Valley Middle Principal Ed Moore. Shamblin would note the importance of the program to Gallia Local School District students as he said a school’s first job these days was to create a safe and secure environment. He shared a story in which he had to speak with a young man regarding his behavior problems one morning and asked him if “he even cared” about what they were talking about. The student replied that at that point in time, he did not. A family member had been arrested the same morning, the student claimed he was hungry and was uncertain of what state his home would be like when he returned after school. Superintendent Meyers thanked Delaney, the principals and morning’s visitors for their support of the program. The program reworks how school breakfast is delivered by offering it to all students at no charge and moving it from the cafeteria to a kiosk in the hall in an effort to improve participation. While most U.S. schools offer meal programs, many students do not participate in cafeteria-based school breakfast programs because of bus schedules, late arrivals to school, pressure to go directly to class or reluctance to be labelled low income. 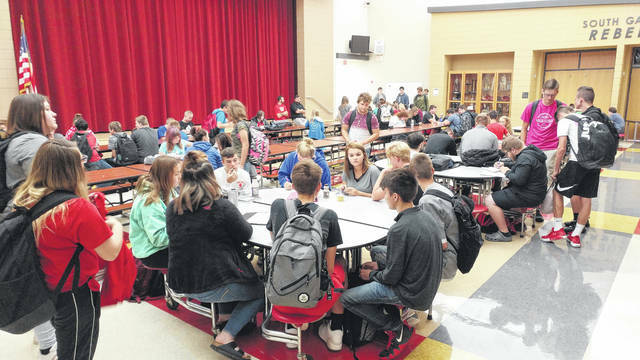 According to a release, before the Partners in Breakfast in the Classroom initiative launched in August 2018, Gallia County Local School District data showed nearly all students were qualified for free and reduced-price meals, yet only a fourth of students were eating the breakfast available to them. Data after starting breakfast to the classrooms showed a growth of around 65 percent of students eating breakfast. The program selected districts from 10 states to participate in the program based on need and potential for success. Other states included are Idaho, Louisiana, Missouri, Nebraska, North Carolina, Oklahoma, Texas and Utah.